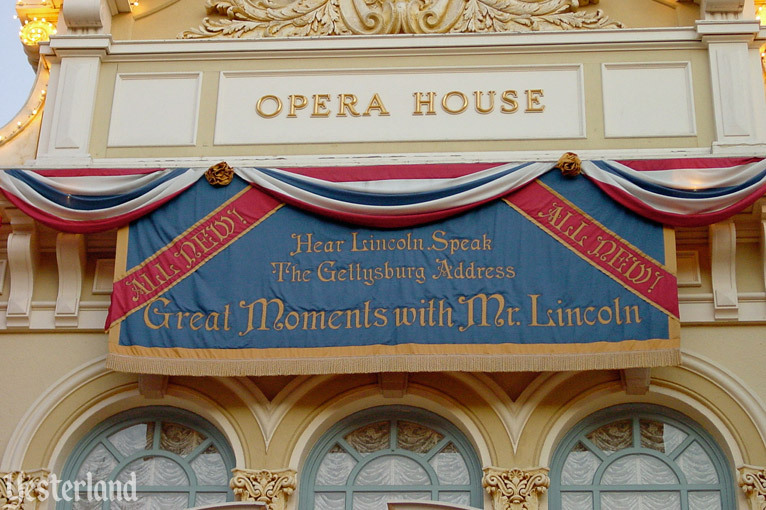 Step into the Main Street Opera House for a tribute to a truly great American… Abraham Lincoln? No. Walt Disney! 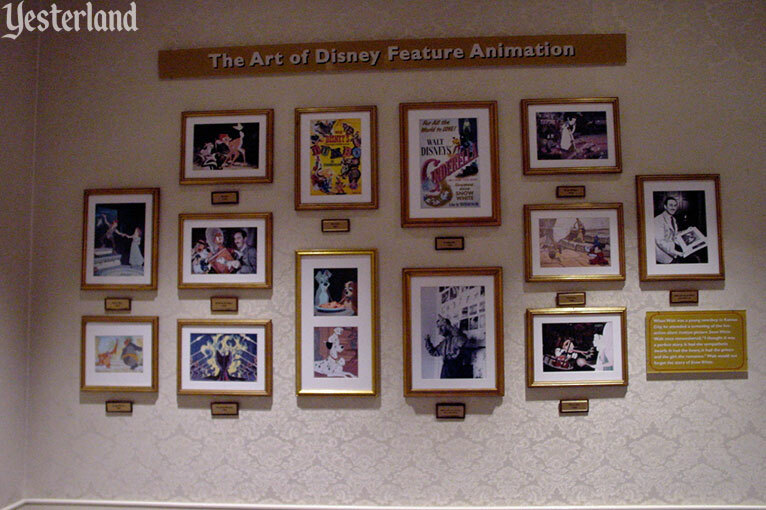 Before you enter the 500-seat theater, be sure to see the large collection of Walt Disney memorabilia in the lobby. 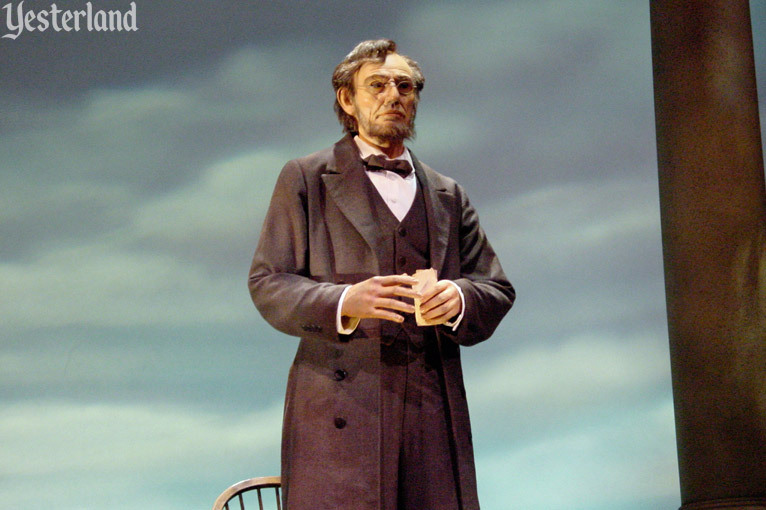 Even without Abraham Lincoln, there’s still an Audio-Animatronic performer. 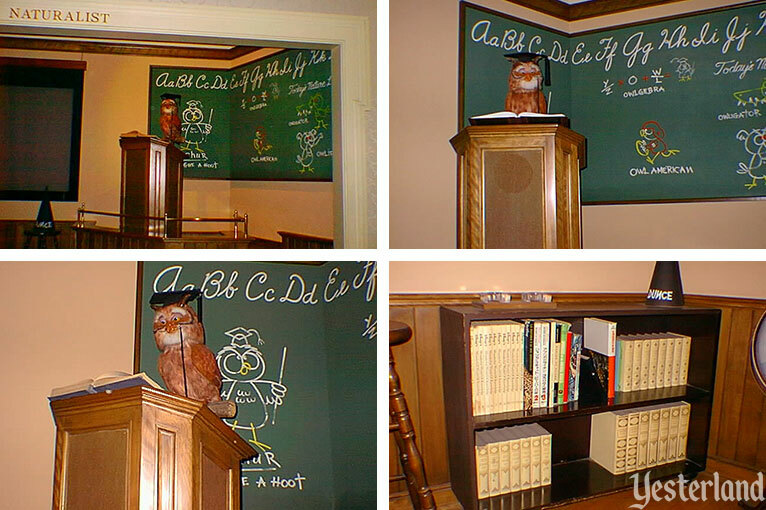 An owl talks about Walt’s love of animals and his series of True-Life Adventures nature movies. After you see the exhibits, relax in air-conditioned comfort as you watch a 28-minute movie biography of Walt Disney. The filmmakers assembled rare footage, such as scenes from early Alice comedies, tracing the life of the creative genius. 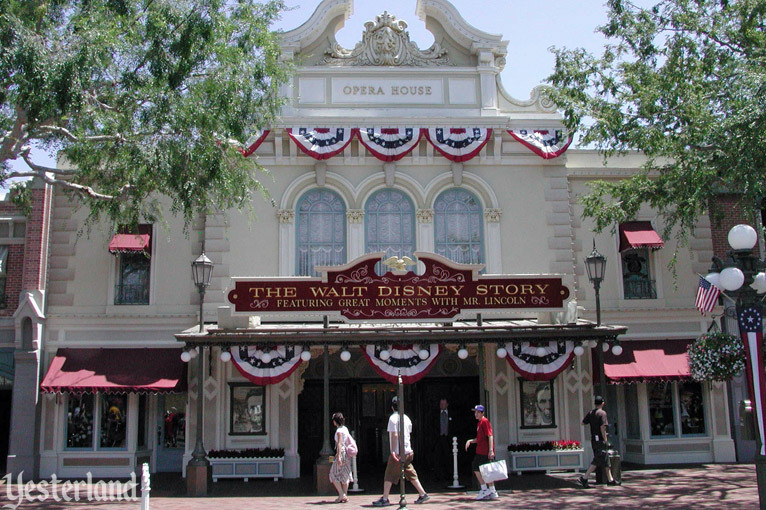 At Disneyland, The Walt Disney Story survived from 1973 to 2005 in one form or another. 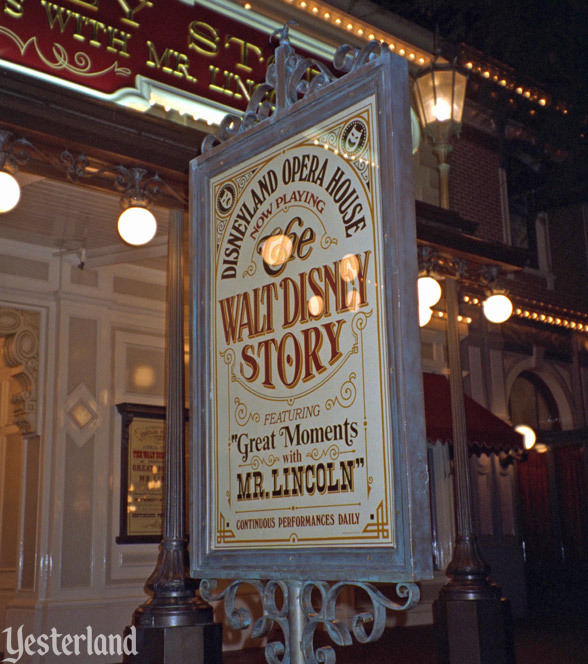 The Walt Disney Story opened at the Main Street Opera House in 1973, replacing Great Moments with Mr. Lincoln. 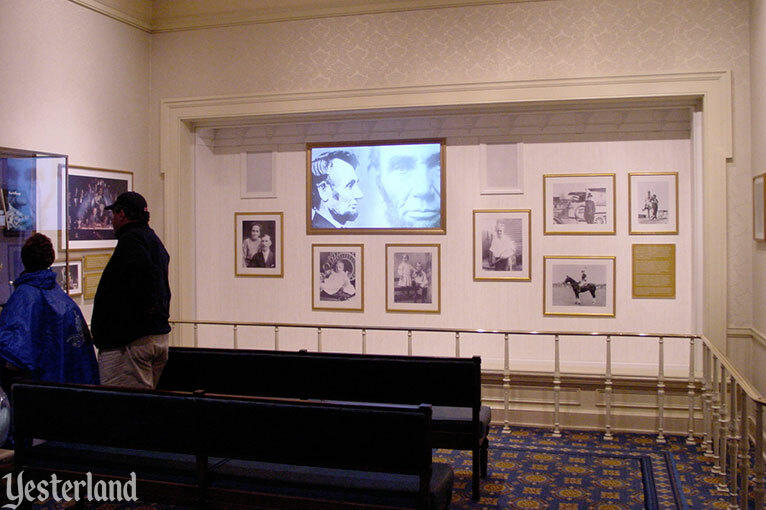 Walt Disney’s Audio Animatronic tribute to the Great Emancipator had been at Disneyland since July 18, 1965 (and originally at the State of Illinois Pavilion at the New York World’s Fair). It was time for something new. Right? Disneyland guests complained that the removal of Mr. Lincoln was an insult to the memory of Walt Disney (1901-1966)—never mind that The Walt Disney Story was supposed to honor Walt. 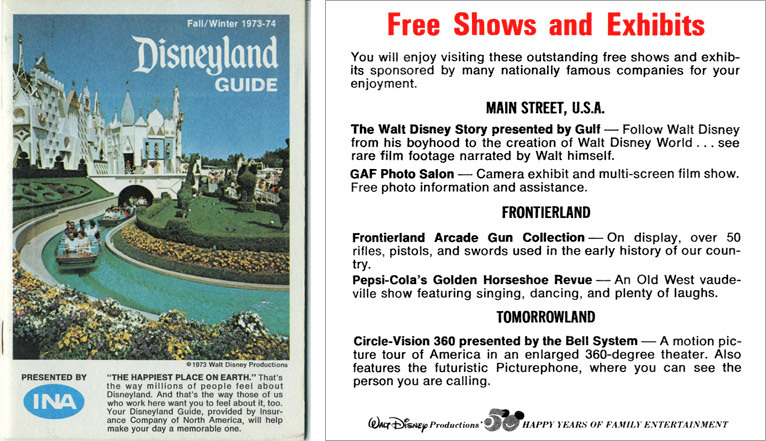 A look at the “Free Shows and Exhibits” section of the Fall/Winter 1973-73 Disneyland Guide (below) confirms that The Walt Disney Story was about Uncle Walt, not Honest Abe. In 1975, Mr. Lincoln returned. Guests seated in the Opera House were treated to a double feature. After the movie about Mr. Disney, good ol’ Audio Animatronic Abe gave his speech. This long presentation had an appropriately long name—The Walt Disney Story featuring Great Moments with Mr. Lincoln. The exhibits in the Opera House lobby still primarily featured Walt Disney. 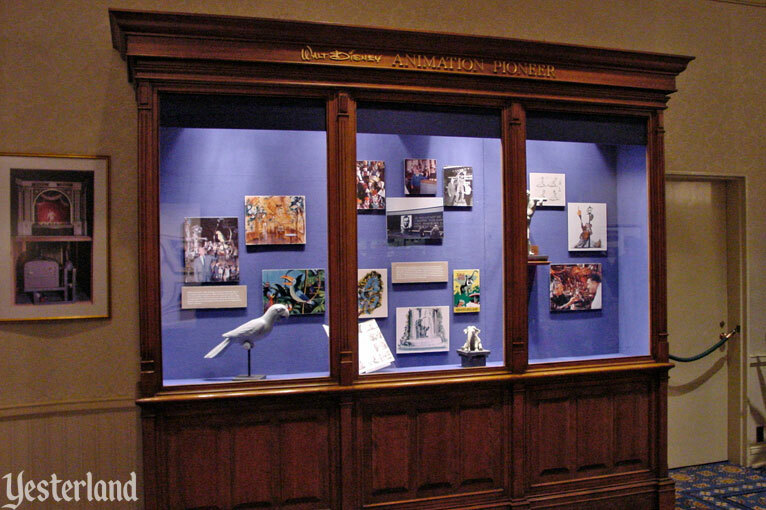 In 1984, the movie about Walt Disney disappeared; a more technologically advanced Mr. Lincoln replaced his predecessor; and the “Golden Dream” music from The American Adventure at Epcot Center replaced the “Battle Hymn of the Republic.” Although some of the Walt Disney memorabilia remained in the pre-show lobby, for all practical purposes The Walt Disney Story attraction of 1973 was history. But the name survived on the marquee. Great Moments with Mr. Lincoln was considered to be an important attraction—almost a sacred attraction—but that didn’t mean that guests regularly filled the theater. They were too busy running off to fun, entertaining attractions. 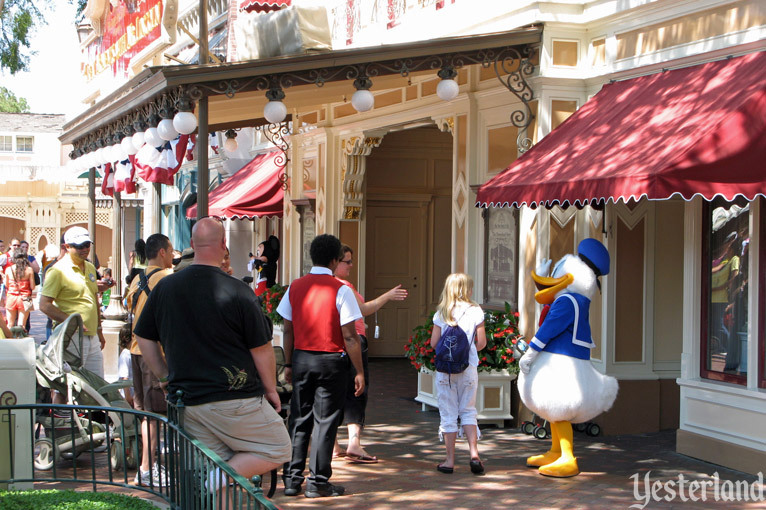 Reports have circulated for the last three months among Disneyland’s 8,000 employees that the Main Street opera hall, which also houses exhibits honoring park founder Walt Disney, would be turned over to Kermit, Miss Piggy and Big Bird. Officials announced a week ago that the Lincoln exhibit would be closed Sunday for the “refurbishing” of the opera house. They said plans for the plush-seated auditorium near the park’s entrance gate would be disclosed later. On Thursday, park operators said Lincoln will live—at least for now. Disneyland spokesman Paul Goldman said park planners are looking at several other sites for the Muppets, including an area near the “It’s a Small World” attraction. “It’s a matter of shoehorning things in,” he said. Goldman said officials were surprised by the outcry over Lincoln. 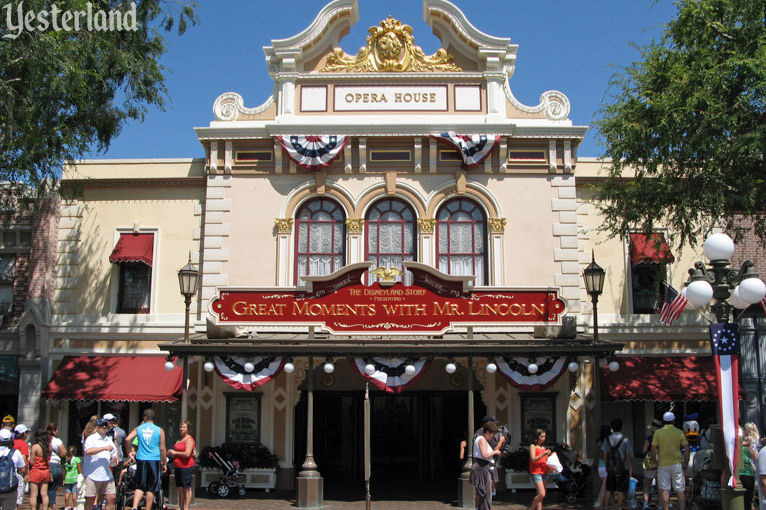 The Main Street Opera House needed something to make the turnstiles click, but ousting Mr. Lincoln was not the answer. A decade after the Muppet blow-up, there was finally a plan to make The Walt Disney Story featuring Great Moments with Mr. Lincoln more relevant, up-to-date, and entertaining. On July 17, 2001, the 46th anniversary of the televised opening of Disneyland, the park celebrated the Grand Opening of a new version. This time, Mr. Lincoln’s speech was preceded by a binaural sound show in the tradition of Sounds Dangerous with Drew Carey at Disney-MGM Studios (now Disney’s Hollywood Studios). The premise was that you would identify with Private Cunningham, a Civil War soldier about to have his portrait done by famous Civil War photographer Mathew Brady. Wearing headphones, you would even experience Cunningham’s haircut, just as guests in Florida would experience Drew Carey’s haircut. On Tuesday, the theme park introduced a new and improved Abraham Lincoln, giving the 16th president a make-over that today’s politicians could only dream of. Lincoln also got a change of clothes, a new hairdo and a new story line enhanced by historic photos and 3-D audio technology. Gone is the tale of Lincoln’s rise from a log cabin to the White House. In its place is the story of a fictional Union soldier who jokes with famed photographer Mathew Brady, meets Lincoln and Frederick Douglass, goes to war, is wounded and has a leg amputated. All in less than 12 minutes. Mr. Lincoln delivered the Gettysburg Address—not the speech that he had been giving since the 1964 New York World’s Fair. Although the Gettysburg Address is one of greatest speeches in the history of the American presidency, the original speech—an edited compilation of various things said by Mr. Lincoln in various speeches—somehow worked better in the context of the Disney presentation. Although the presentation changed to “The Journey to Gettysburg,” the marquee and attraction remained the same. “The Journey to Gettysburg,” quietly reached its end on February 20, 2005. 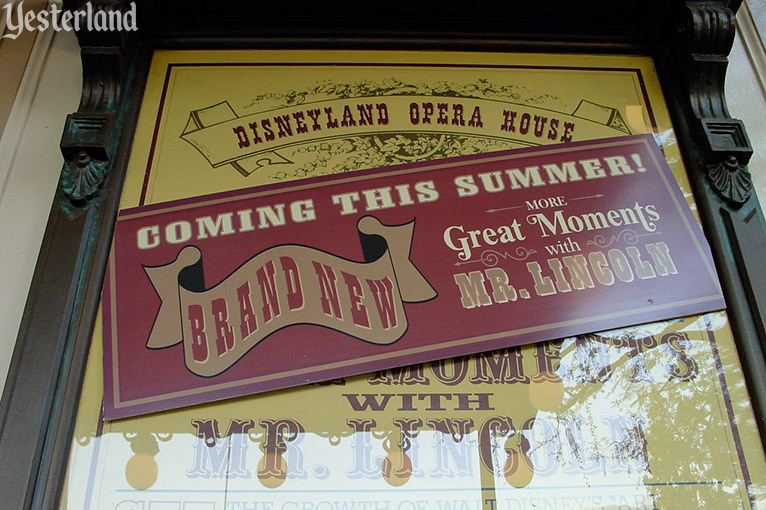 The marquee letters for The Walt Disney Story featuring Great Moments with Mr. Lincoln came down. Mr. Lincoln went on vacation. May 5, 2005, Disneyland launched the 18-month “The Happiest Homecoming on Earth” celebration, marking the 50th anniversary of Disneyland. 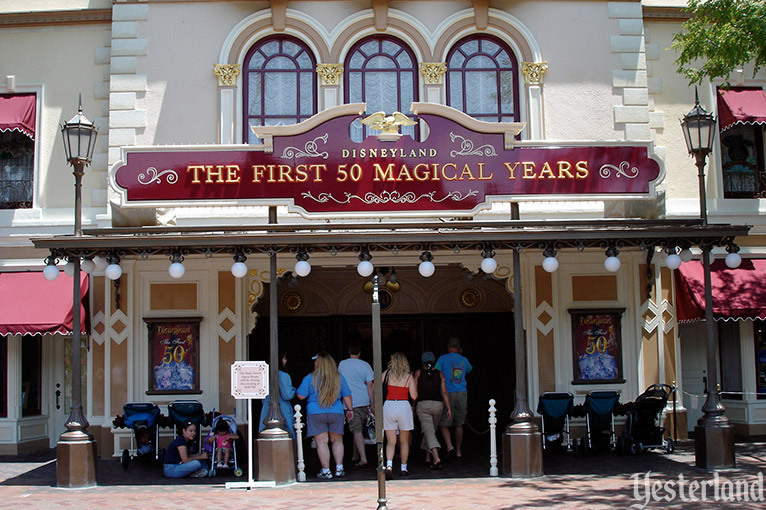 The new show at the Main Street Opera House was The First 50 Magical Years, a film starring Steve Martin and Donald Duck. (Also in 2005, Steve Martin was named a Disney Legend.) All sorts of Disneyland art, models and mementoes filled the Opera House lobby. The plan was for a well-rested Mr. Lincoln to return right after the end of the celebration. However, guests continued to hear only Mr. Martin, not Mr. Lincoln, through March 15, 2009. 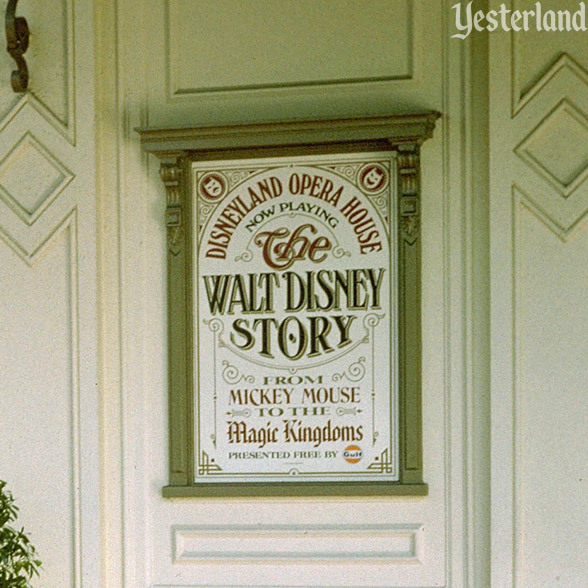 However, The Walt Disney Story—the subject of this Yesterland article—would not be back. When that sign came down in 2005, The Walt Disney Story went away forever. 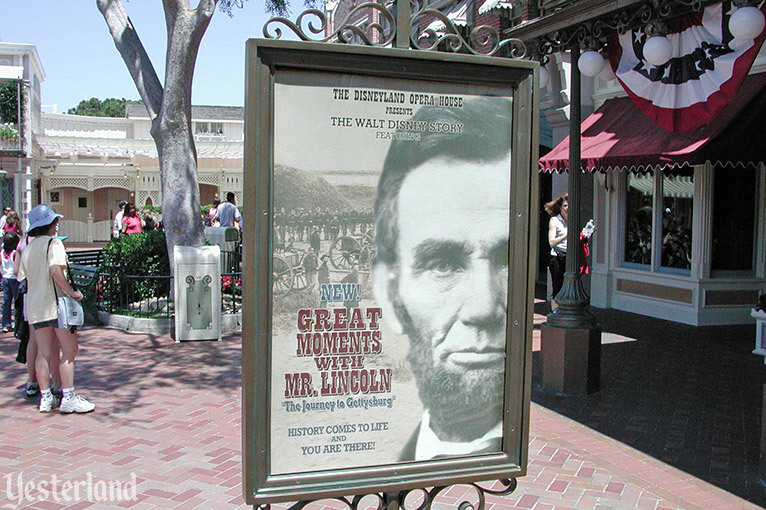 The new name would be The Disneyland Story, featuring Great Moments with Mr. Lincoln. Mr. Lincoln returned to the Opera House on December 18, 2009. Guests can still catch the film with Mr. Martin and Mr. Duck, but it’s now on a smaller screen in the lobby. 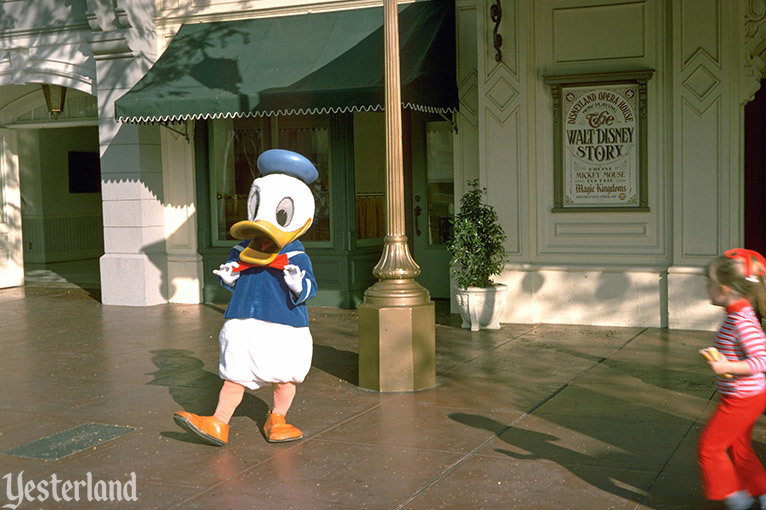 There were many changes between the first photo and the final photo in this article—but Donald Duck still seems to like this location.